We are a big allergy family. At Halloween, we have to throw out everything with artificial colors, nuts or gluten. At Birthday parties or school parties, my kids do not get to eat birthday cake, cupcakes or pizza. They miss out on so much which is a real bummer. So when I send in school treats, I try to send something that is more all inclusive. If I can make something normal for just one allergy kid, that makes me happy. 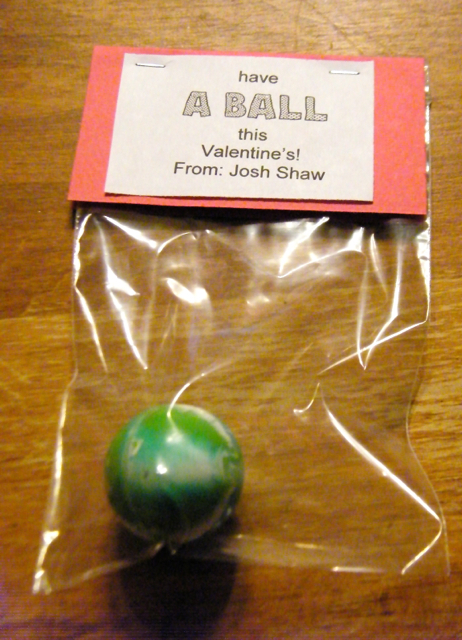 So for Valentine's Day, I dug into my Pinterest folder to see what I could see. I came up with these great ideas that were so easy to execute. The first step is easy, just gather your supplies. 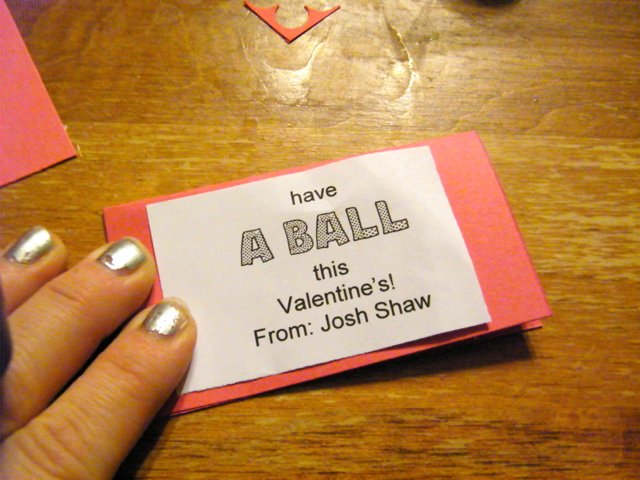 I chose red cardstock since it was a Valentine, after all. A bag of 12 bouncy balls ($3 at Target for a bag of 12 - look in the party section), stapler, your paper Valetine and plastic bags. The paper Valentine I printed out using Word on my computer. The plastic bags I bought at Walmart in the craft section near the beads. A sandwich baggie would work too. OK, first measure your bag to determine your cardstock size. My bag was 2.5 inches wide, so I made a card stock square measuring 2.5 x 6. Fold in half and attach your printed out Valentine with a tape runner or your favorite adhesive. Place the toy inside the plastic bag. 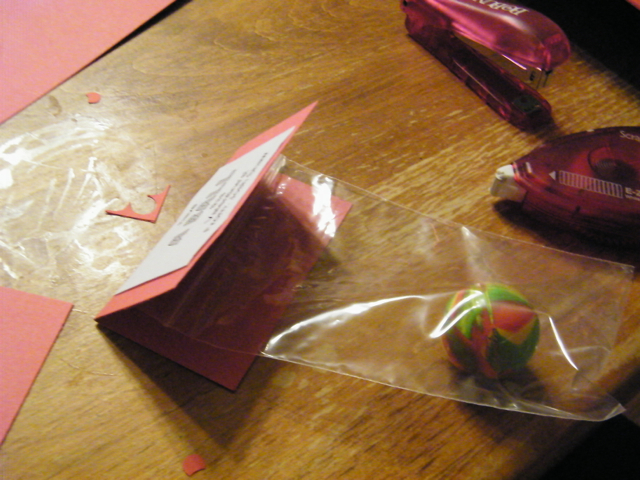 Fold the card stock over the bag. Next, just staple the cardstock onto the bag. Make sure the bag is fully attached to the card stock. When stapling, it's easy for the bag to slip down. All done! 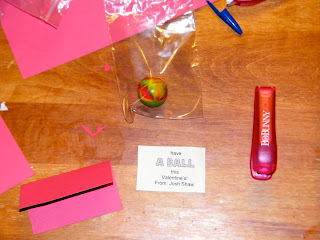 This is a great way to provide favors or holiday treats that are cute and allow you to think outside the box. Change the colors, the paper, the treat, and you have endless world of possibilities. 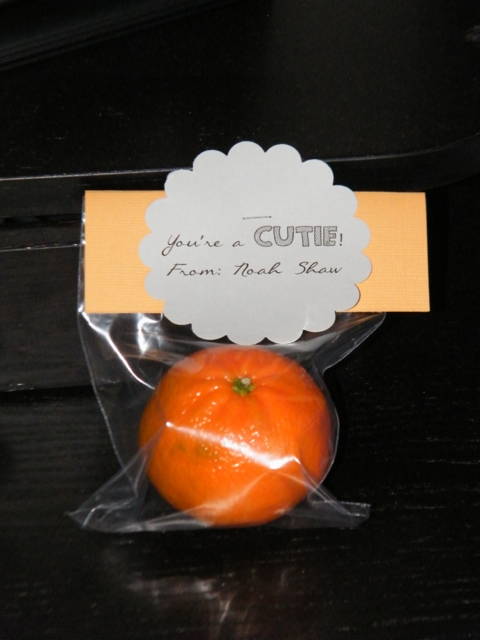 This "cutie" clementine was perfect for my younger son's preschool class. Nice break from all that sugar, and the kids loved them.